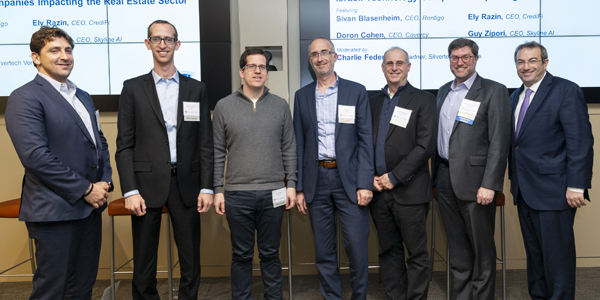 On Wednesday, March 13, 2019, the Office of Alumni Affairs held a professional networking event to discuss how “big data” in all its forms—artificial intelligence, machine learning, blockchain—has finally come to disrupt the real estate profession. 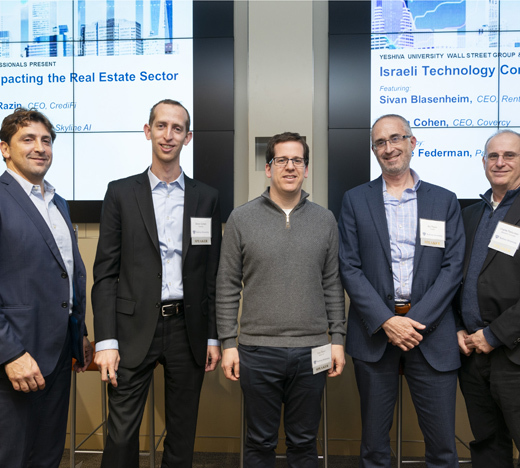 Sponsored by the Yeshiva University Wall Street Group and Real Estate Professionals along with GateGard, an electronic “doorman” service, and hosted by Goodwin Procter LLP, “Israeli Technology Companies Impacting the Real Estate Sector” featured a panel discussion by Sivan Blasenheim (CEO of Rentigo), Doron Cohen (CEO of Covercy), Guy Zipori (CEO if Skyline AI) and Ely Razin (CEO of Credifi) moderated by Charlie Federman, partner at Silvertech Ventures. In his opening remarks, Lawrence Askowitz ’87YC, co-chair of the YU Wall Street Committee, described alumni events like this, where the two networking groups have teamed up to create an exciting presentation on a timely topic, a “win-win-win-win.” The first win, said Askowitz, is for the thousands of alumni members of the groups as they take advantage of their access to high-level contacts and detailed inside information. The second win is for the panelists, who not only have the opportunity to talk about their new and exciting ventures but also have the chance to strengthen their companies’ relationship with Yeshiva University and the University’s tight-knit relationship with Israel. And the last win is Yeshiva University itself, which has invested substantial resources in the last decade into this kind of professional programming so that more and more events like this can be offered to more and more people. For next hour, the panelists, under Federman’s guidance, spoke about how the real estate industry has been glacially slow to adopt the efficiencies offered by technological innovation. Zipori of Skyline AI noted, and all the panelists agreed, that real estate has been one of the last industries to let itself be disrupted by new technologies, and Blasenheim, whose company, Rentigo, works closely with the property management industry, gave several examples of just how slow this adjustment is: in an era of online banking, most financial transactions between managers and tenants are done by paper checks, and in a world with multiple communication platforms, managers will still slide fliers underneath doors and leave envelopes in mailboxes. To speed up this transition, Razin of Credifi works toward making real estate financing as transparent as possible so that market processes can be smoother and more seamless, a business model also used by Cohen of Covercy, who wants to use data, both big and small, to modernize the investment process and make it as transparent and automated as possible. In the Q&A segment, questions came up about the pitfalls and promises of artificial intelligence, whether the democratization of information increases risky decision-making by ill-informed people and if blockchain is a solution to a real problem or an interesting technology searching for a reason to be.